After Trump revoked Brennan’s security clearance, White House press secretary Sarah Sanders said other former US officials may lose theirs. Their status is under review. See below. 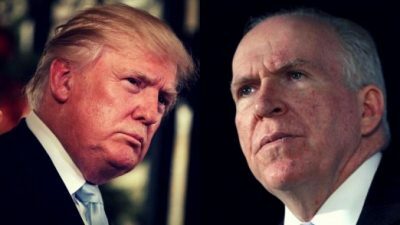 Have no sympathy for Brennan. He’s responsible for cooking up Russiagate – falsely claiming the Kremlin interfered in America’s political process, a bald-faced lie. .
DNC/John Podesta emails were leaked, not hacked – an indisputable fact media suppress to their disgrace. The Big Lie alone matters when it’s the official narrative. The Russian meddling hoax and phony Kremlin threat to US security are central to maintaining adversarial relations with America’s “invented enemy”. Russia and other invented enemies justify pouring countless trillions of dollars down a black hole of waste (military spending), fraud and abuse at the expense of eroding social justice and other vital homeland needs. They’re pretexts for waging permanent wars of aggression against nations threatening no one – an endless cycle of slaughter and destruction, human misery inflicted on countless millions,. Washington’s bipartisan class shares guilt for what’s going on, Trump the latest in a long line of US warrior presidents. Former DNI James Clapper, former NSA and CIA head Michael Hayden, Sally Yates, Susan Rice, Andrew McCabe, Peter Strzok, Lisa Page, and Bruce Orr. Former FBI director James Comey’s security clearance was rescinded at the time of his sacking. All of the above officials are undemocratic Dems. All are members of Washington’s elite, unaccountable for their abuses of power while in office. That’s what matters most. Revoking their security clearances usually retained by former officials is inadequate, a slap on the wrist alone. Security clearances of former GOP elite members aren’t under review by the Trump regime. Washington’s current and former criminal class is bipartisan. The issue isn’t whether they retain or lose their security clearances. It’s failure to address their past and ongoing high crimes against humanity at home and abroad. Bill and Hillary Clinton, GW Bush, Cheney, Obama, and countless other members of Washington’s elite are legally, ethically and morally compromised beyond redemption. Yet they’ve become super-rich from their disservice to the nation and humanity, from high crimes too egregious to ignore.